Honeywell's battery-powered RTH110B thermostat has a thermometer that detects the current temperature, and controls your gas, oil or electric furnace and central air conditioning system to automatically keep your home at a comfortable temperature when the weather is excessively hot or cold. When you are satisfied with the temperature, but would like to keep the air flowing, the RTH110B can operate in fan mode. 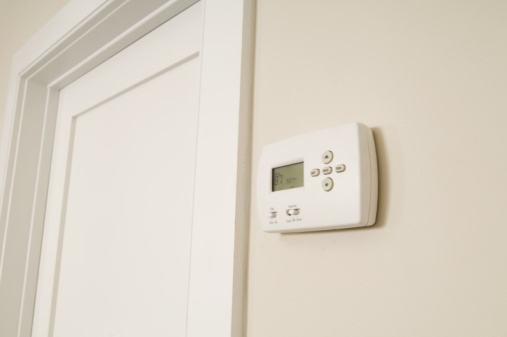 You can easily configure the thermostat to keep your home at the temperature you desire. Press either the up or down button on the front of the RTH110B thermostat once to view the current setpoint. The setpoint temperature, which activates the heating and cooling system, will appear in the thermostat display for five seconds along with an arrow icon, and then it will revert to its normal display, showing the current temperature. Press the up or down button more than once to change the setpoint until it reaches the temperature you want the heating or cooling system to activate. Slide the system operating mode selector switch to "Heat" to activate the heating mode, or "Cool" to activate the cooling mode, or "Off" to turn off the system. Slide the fan's selector switch to "Auto" to run the fan automatically when the heating or cooling is activated, or set it to "On" to have the fan run all the time. Press the up and down buttons simultaneously and hold them for three seconds to activate the configuration menu. Press both buttons again simultaneously to go to the temperature display. The setting will show either an "F" for Fahrenheit, the default; or "C" for Celsius. Press the up or down button to switch between "F" and "C." Press both buttons again simultaneously to go to the next menu, "Heating Cycles Per Hour," which is indicated by a flame icon. Press the up or down button repeatedly to adjust the number of heating cycles per hour from two to six times. Press both buttons again simultaneously to go to the next menu, "Cooling Cycles Per Hour," which is indicated by a snowflake icon. Press the up or down button repeatedly to adjust the number of cooling cycles per hour from two to six times. Press the up and down buttons simultaneously and hold them for three seconds to exit the configuration menu.